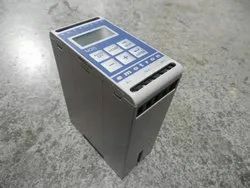 We are a leading Manufacturer of emotron m20 shaft power monitor from Pune, India. The Emotron M20 shaft power monitor protects your pumps and other equipment against damage and downtime. Early warnings allow for preventive action, thus reducing maintenance costs and increasing reliability. Using the motor as a sensor also reduces installation costs. The Emotron M20 shaft power monitor offers advanced multi-function monitoring thanks to two output relays, an analogue output and a display for load indication and parameter settings. The Emotron M20 immediately detects over- and underload due to, for example, a pump running dry or a crusher jamming. A unique technique to calculate shaft power results in an accurate and reliable supervision across the whole load range. A special feature offers high accuracy also in the event of very small load variations. An analogue current output signal can be used to scale the machine load to the actual working range. The signal can be used as an input to indicating instruments, controllers or PLCs. The Emotron M20 uses an Auto set feature that allows four protection set points to be established in just three seconds. By pressing Auto set during normal operation, the warning and stop levels are calculated automatically on the basis of the actual motor load measured. Using the motor as a sensor eliminates the need for external sensors and extra cabling, and no holes need to be made in pipes. The result is increased reliability and reduced investment, installation and maintenance costs.